Andy Awford and then Steve Cotterill spotted the potential of the 17-year-old Lewes midfielder. Yet nobody quite realised the rich goal-scoring promise of the most recent entry into Pompey’s 100-club. Jed Wallace last weekend capped a whirlwind start to his Blues career by reaching a century of appearances. Aged only 20, in the process he has recorded 24 goals, of which three have arrived from the penalty spot. 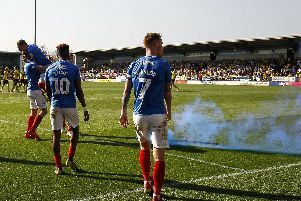 According to Awford, it is a crucial aspect of Wallace’s game which hadn’t materialised during his first 13 months at Fratton Park following an August 2011 switch. That altered during a two-and-a-half month loan spell at Isthmian League side Whitehawk. With a return of 12 goals in 13 matches, Wallace was recalled to enable him to record a Football League debut at Swindon Town in January 2013. Since then the goals have flowed for last season’s top scorer and the present leader this term. Awford said: ‘I remember Jed’s first game against Coventry for the youth team and he was shocking. He was shocking. ‘He wanted to take the corners, the penalties, the throw-ins and the goal kicks. ‘He wanted to take kick-off, play the off-side trap and put the nets up. He wanted to do everything. ‘Me and Paul Hardyman were looking at this young, raw lad and could see he had something but we had to slow him down, calm him down. ‘He’s a little bit like Speedy Gonzales but that is Jed – he wants to play at pace. ‘When he is playing at tempo that is when you get the best out of him. When he tries to think about things too much then maybe it breaks down a bit. ‘What we didn’t realise was we were getting goals. ‘In the youth team he was getting in but not scoring. He wasn’t converting his chances. That was a little worry of ours. ‘Then he went to Whitehawk and since he came back his goal-scoring record has been phenomenal for a wide player. ‘Jed works and works and works. In some sessions he is average, like they all are, but whether he is average, good or bad he will stay out there and work. ‘I’ve have seen him come on to his left foot and score at Exeter and Yeovil this season but he couldn’t kick a ball with his left foot two years ago. ‘Now because he has worked at it his finishing is very good with that foot. ‘The headers he scored at Newport last season and Morecambe this season were great finishes. ‘He is regularly out there with Dan Butler, who is sticking them in the box. Wallace’s progress continues to be monitored by scouts at Fratton Park and Awford believes plenty deserve credit for bringing the youngster to the Blues. He added: ‘An agent asked if I could watch him so I did. He then had a week’s training with us and we liked him. ‘I told Steve Cotterill, who played him in a behind-closed-doors friendly against Swindon – Steve then also wanted him. ‘I told him I didn’t have any money and would need it from his first-team budget and he said “Okay, we’ll do it”.